with… a Mecha Godzilla Welcome! while also offering up a good amount of info on Japanese sci-fi series & monster films, history, toy reviews, & discussion of vinyl art. 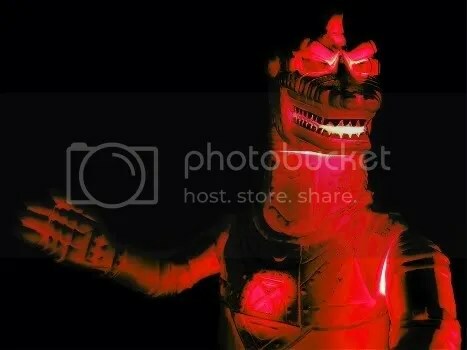 This entry was posted on July 17, 2008 at 3:18 am and is filed under The Kaiju Art Collection with tags art, godzilla, HDR photography, japan, Kaiju, mechagodzilla, monsters, toys, ultraman, vintage, vinyl. You can follow any responses to this entry through the RSS 2.0 feed. You can leave a response, or trackback from your own site. Thanks Raymond! It sounds like you have the makings of a killer collection already! As far as buying more kaiju…depending on what type of collection you want to invest in… vintage, vintage reproductions, or some of the new ‘urban vinyl’. Try Super7store.com to start as they have a good mix of all. kaiju-taro.com. Those should get you started. Of course there’s always ebay! Good Luck…It’s a great hobby! I would love to hear/see your new finds! A warning though…once you start collecting these various beasties, it can be very addicting…and hard on the wallet! It sounds like you’ve caught the Kaiju bug already though! I really prefer Flickr.com to show my Kaiju Art. It’s free & easy to share pics!